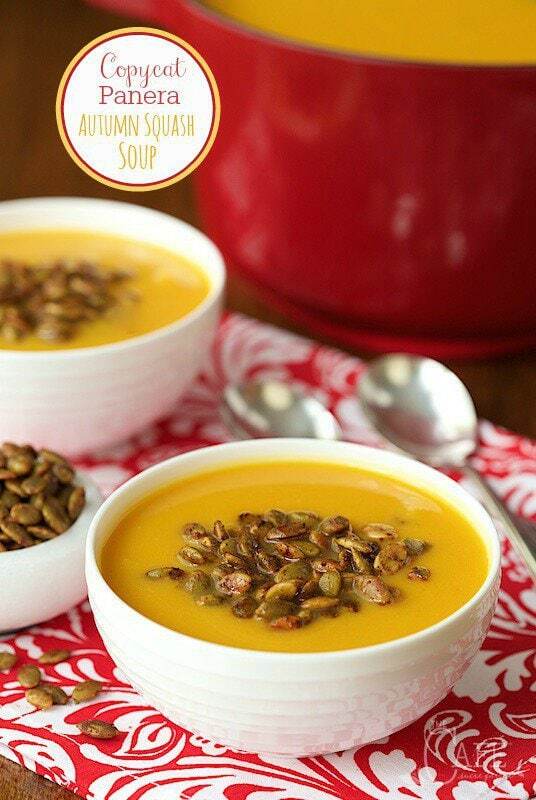 Copycat Panera Autumn Squash Soup – have you tried this soup at Panera? Oh my word, it’s wonderful and I think this one’s really close! I couldn’t stand it another day, I had to figure it out! 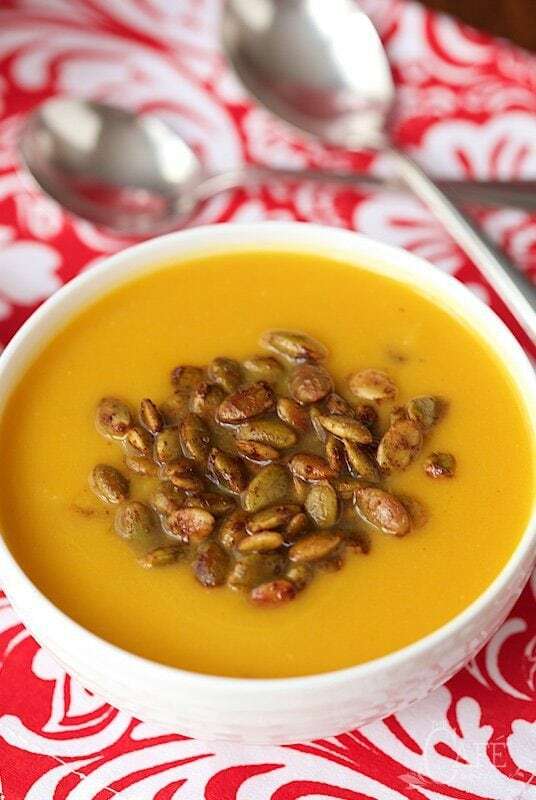 Although I already posted a butternut squash soup this season, this one is quite different. It’s also crazy delicious. And honestly, I’m a bit obsessed with it. 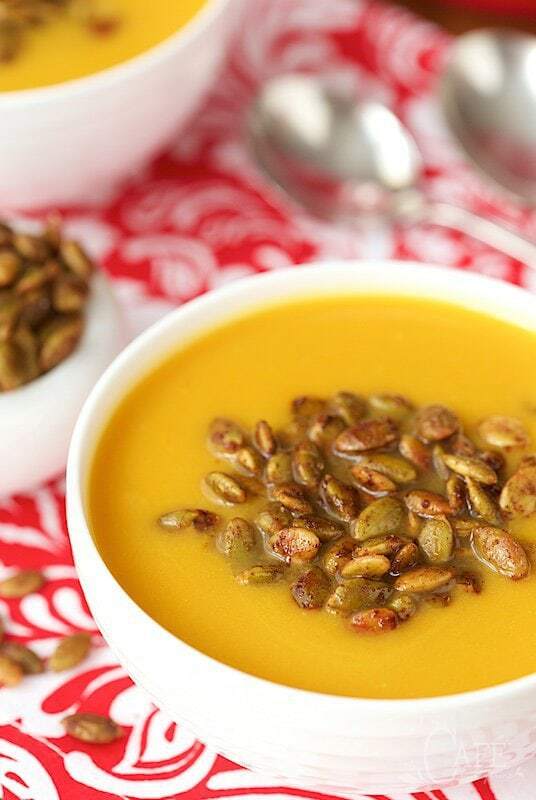 Anyway, as far as I’m concerned, you can’t have enough delicious, healthy soup recipes when the cold winds start to blow and this Copycat Panera Autumn Squash Soup is both! After that day, I found lots of excuses to visit Panera again. And again. There are lots of new seasonal items on their menu at this time of year. Did I try anything else? Nope, I was an old stick in the mud, ordering the same thing over and over. It might have been because was so intrigued with the delicious flavor and just couldn’t put my finger on what made it so good. It’s creamy, silky smooth and full of flavor. But what was the flavor? After the third or fourth visit, I couldn’t stand it anymore. I wanted to be able to make it myself, serve it to family, enjoy it with friends, present it in small pretty bowls for dinner parties and warm up with it after bike rides on clear, cool autumn days. I knew I had to figure it out! Cinnamon and a hint of curry? I would not have guessed curry but but I was beginning to see what gives the soup that depth of flavor. It was time to get to work. I picked up butternut squash and a sugar pumpkin (see notes below for what kind of pumpkins are best for cooking and baking). I had everything else I needed. The squash and pumpkin were simply halved, then roasted till soft and tender. After that, it’s was easy. It took a few tries to get it just right but I realized it was the combination of curry and cinnamon, in small amounts that made this soup so uniquely delicious. I did add a few of my own touches. I love incorporating lots of veggies in my soups to bump up the nutrition so, in addition to onions and garlic (the usually base for many soups), I added shallots and carrots along with the roasted butternut squash and pumpkin. The veggies and spices are simmered with chicken stock while the pumpkin and squash roast, then everything is blended till silk smooth and gorgeous. I believe Panera uses cream in their soup, I just add a big scoop of Greek yogurt to keep the calories down and add a delicious creaminess. 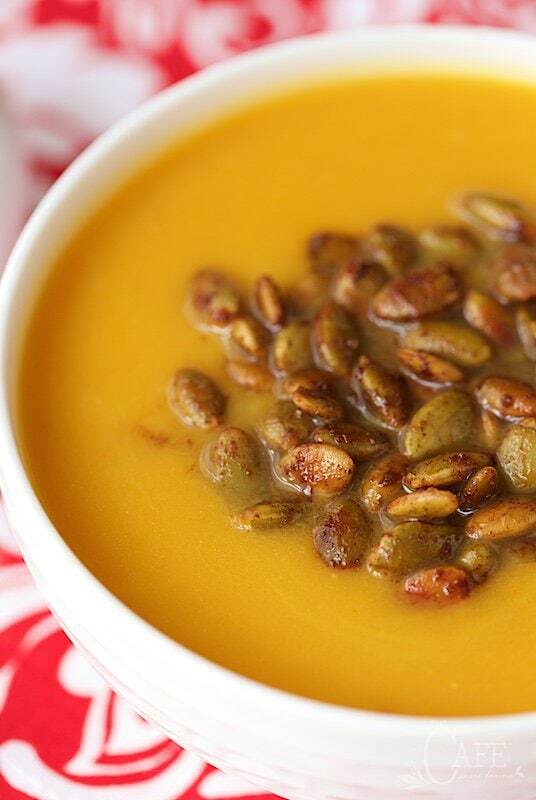 Panera tops their soup with a sprinkle of toasted pumpkin seeds. 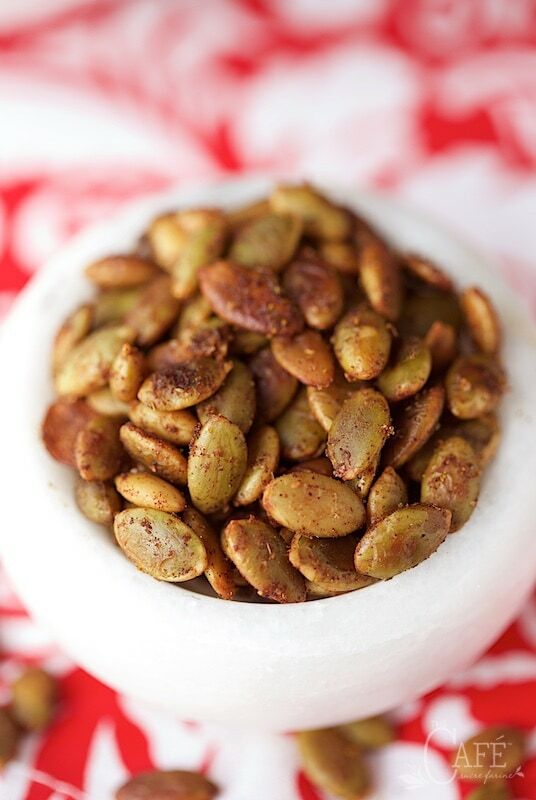 I sautéed pumpkin seeds with a touch of butter and a sprinkle of paprika, curry and sea salt. I like adding a generous scoop of these flavorful seeds when I serve my soup. So there you have it. I pretty sure that I’m decently close to imitating the yummy Panera soup. I’m definitely sure this version will be repeated over and over again here at The Café. It’s so satisfying, it comes together in less than an hour, is perfect for home or work lunches, would make an elegant appetizer soup or a lovely light dinner served with warm crusty bread and a simple green salad. 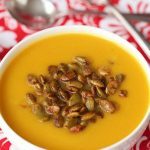 I have a feeling that once you try this Copycat Panera Autumn Squash Soup, it will be a frequent request at your house! P.S. There are a few kitchenwares that I’d be hard pressed to live without. Well, I could for sure, but they do make my life in the kitchen much easier. Near the top of my list is my immersion blender. I love this thing. It’s reasonably priced and makes preparing a pot of soup like this so… simple and a lot less messy. It’s also has an attachment for a small chopper which comes in super handy. While squash and pumpkin are roasting, heat oil in a large Dutch oven over medium heat. Add onions, carrots and shallots and sauté for 3-4 minutes or until slightly translucent and soft. Add minced garlic, curry and cinnamon and cook for another minute or until nice and fragrant. Add broth, apple juice and salt and bring to a boil. Reduce heat and simmer uncovered for about 20 minutes. Remove from heat and set aside till squash and pumpkin are finished baking. When squash and pumpkin* are tender. (Pierce them with a small thin-bladed knife to tell - it should insert really easily.) Set aside till cool enough to handle, then scoop out flesh and add to Dutch oven. Return mixture to a boil, then reduce to a simmer and cook for another 10 minutes. Remove from heat and puree with an immersion blender or transfer mixture, in several batches to a regular blender**. Puree until very smooth and silky. Add Greek yogurt and pepper and stir to combine.Taste and add more salt if needed (There are a lot of veggies to season in this soup so don't hesitate to add more salt if the taste is bland.) You also may want to add a tablespoon or two of honey. My squash was very sweet and it didn't need any extra sweetness. The description of the Panera soup does include honey. 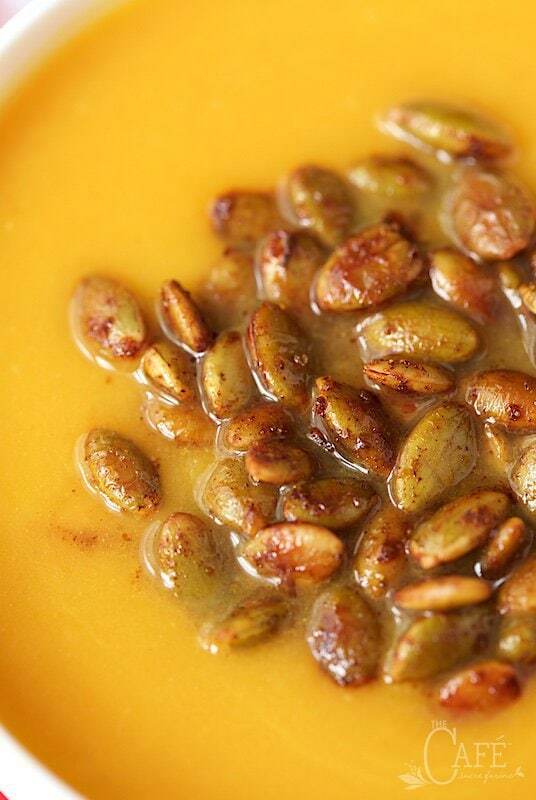 For the pumpkin seeds, melt butter in a small sauté pan over medium heat. Add pumpkin seeds and stir to coat. Sprinkle with paprika, curry powder and salt. Continue to cook for 2-3 minutes, stirring continuously, or until pepitas begin to turn golden. Taste and add a bit more salt, if needed. Remove from heat and set aside to cool. * Those big pumpkins you see at the pumpkin patch are perfect for jack-o'-lanterns but they're not good for cooking. Their flesh is stringy, bland, and watery. Instead look for the smaller pumpkins with a smooth-textured flesh. They are sweet, flavorful and "meaty". Look for pumpkins labeled "sugar pumpkins" or "pie pumpkins". Some specific names are Baby Pam, Autumn Gold, Ghost Rider, New England Pie Pumpkin, Lumina (which are white), Cinderella, and Fairy Tale. ** If using a regular blender, be careful. The steam from hot liquids can create pressure and actually blow the lid off and make a huge mess, if the center insert is in place. To prevent this, remove the center insert and cover the opening with a folded towel. Alternatively, you can insert a narrow tip funnel into the opening and hold it in place. This will also allow the steam to escape. Serving size is 1 cup. Recipe will yield 10-12 cups, depending on size of squash and pumpkins. Thanks so much for the recipe! I mostly followed it, didn’t add carrots, and it was a really big hit at our Christmas Eve dinner. Thanks, Donna, so happy you enjoyed it! I used your recipe, and it’s very tasty, but please, why have you fallen into that old recipe-site trap? If you add things that aren’t in the original, or you change things, it’s not a copycat anymore. It’s just a good squash and pumpkin soup recipe. Haha! You’re right, Dave! That’s just my nature, to try to make things even better. You can’t exactly duplicate a restaurant recipe, since you don’t have the exact recipe, but you can try your best and then improve on that just a tad. But where are the apple bits? the Panera Autumn soup also contains “sweet apple” which gives it nice textural bits! Hi,skipped the apple juice and added real apples.It added extra fiber which makes this soup really filling and satisfying.I made a big pot ,ate it for a week because it was so good and lost 3 lbs! Also since there is no meat I was very ” regular” for the week. I love it, Andrea! Thanks for sharing your results! That’s awesome that you lost weight! Love this soup! Tastes exactly like the Panera soup and is delicious. I used garam masala for the curry which I thought was perfect. Thanks so much for posting the recipe. Thanks for sharing your results Betty. I’m so happy that you enjoyed this soup as much as we do!! Great soup! I used two cans of pumpkin instead of a pumpkin and I added the honey–it’s not about the sweetness, but the extra dimension it adds. Just about overtopped my large Dutch oven. Thanks for sharing your results Lori! Panera has its soup ingredients (pasted below) posted on the website. To me the key flavor Panera’s soup is the ginger. Far too much sugar though (20g)! 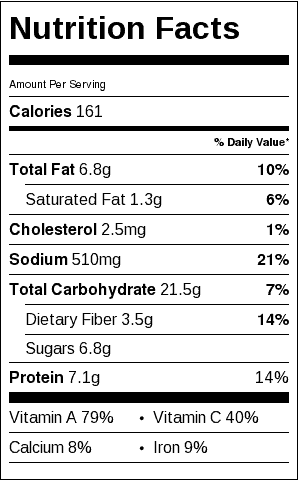 Pumpkin, Vegetable Stock (Water, Vegetable Base [Carrots, Celery, Onions, Tomato Paste, Corn Oil, Yeast Extract, Potato Flour, Salt, Onion Powder, Garlic Powder, Natural Flavor]), Milk, Cream Cheese (Pasteurized Milk and Cream, Cheese Culture, Salt, Carob Bean Gum), Brown Sugar, Butternut Squash, Heavy Cream, Contains 2% or less of: Carrots, Onions, Butter (Cream, Salt), Apple Juice Concentrate, Sugar, Corn Starch, Salt, Ginger Puree (Ginger, Citric Acid), Honey, Lemon Juice Concentrate, Curry Powder (Spices, Turmeric, Onions), Spices and Nisin Preparation. Hi Chris, oh does this sound delicious, I made your crock pot mash potatoes last night and they came out perfectly, love that you had us add buttermilk. Can’t wait to make this soup!!!!! Pinned! I called Panera and the soup does not have cinnamon. The spice it has is allspice. Also does not have onion but onion powder. I am going to try and make this soup tonigh. I am in love with it!!! I wonder if someone might have been misinformed. On the Panera Website (https://www.panerabread.com/en-us/featured-menu/todays-soup.html#vegetarian-autumn-squash-soup) This is how they describe the soup: A rich blend of butternut squash and pumpkin simmered in vegetable broth with select ingredients including: honey, apple juice, cinnamon and a hint of curry, then finished with sweet cream and topped with roasted and salted pumpkin seeds. I’m sure it will be good with allspice. I made this soup today and it was delicious. I added some brown sugar (I like it a little sweeter) but all in all it was very good. I found the texture to be perfect. I would make it again. I can’t wait to try this recipe! I am from Canada and don’t have a Panera here. My mom, sister and I go shopping in Seattle every fall, and last year came across this wonderful soup when we went there for lunch. We also went back to Panera this year as well… twice!! – just for this soup. So sorry you did not have good results Karen. We enjoyed it very much and other readers have too. I completely agree it’s nothing remotely close to panera. It’s a fine soup but definitely mislabeled as a Panera copycat. Can you offer advice for making this in advance and reheating? I would like to serve as first course on Thanksgiving but will find it difficult to prepare while cooking everything else. Hi Anita, this soup can be made ahead and it reheats beautifully, either on the stove top or in the microwave. It also freezes well so you could make it way in advance. Absolutely delightful! I just made it. I added the honey as suggested and instead of Greek yogurt I used 3/4 of heavy cream. The taste is very similar to Panera….makes quite a large batch. Next time, I might make a half recipe. All in all….Delicious! The soup is delicious! I added in maple syrup instead of honey and it was wonderful! Thanks Chris for this recipe. I’ve been twice to Panera and loved this soup. Was so happy when I found your recipe. Thank you for all you share! I made a squash soup last fall for a harvest fest taking place on an organic farm I volunteer on. It was absolutely amazing but I think I might have to give this recipe a try. 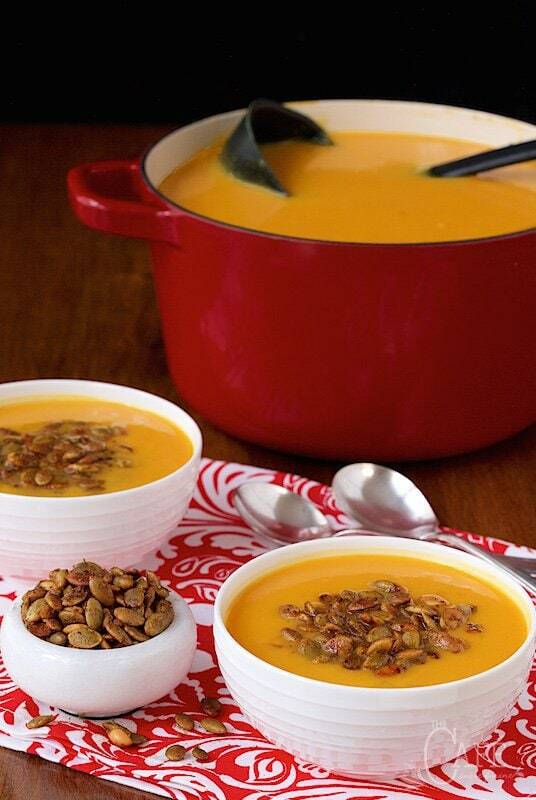 I think you’ll love it, it’s such a comfort soup, especially in the crisp fall months! I just tried this soup at aPanera restaurant and fell in love with it. I live 300 miles from there so would love to make it at home. I would use almond or coconut milk since I have a dairy allergy. Thanks so much for sharing. I too wonder if it could be frozen. Also, I have never tried curry . What brand spice do you recommend? Hi Joyce, yes this can definitely be frozen. Look for a mild curry. I really like the curry that Trader Joes sells. My husband did love the pumpkin seeds though! Thanks for sharing your recipe, Scott & Chris. Blessings. I love the Autumn soup at Panera. So I decided to try and make it myself. I found this recipe and it’s very close to the original, though I found it to be a bit bland. I didn’t have a sugar pumpkin on hand, so I used pureed pumpkin and also didn’t roast my squash. I also added brown sugar, a bit of maple syrup, nutmeg, hot curry, garlic powder (along with fresh garlic), red pepper flakes, coriander, cumin, and rosemary. it was AWESOME! and tasted very similar to Panera!